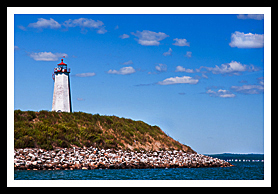 Connecticut's second oldest lighthouse, Faulkner’s Island Lighthouse, also referred to as Faulkner Island Lighthouse, was built in 1802, due to the many shipwrecks that occurred around the island. Even with the lighthouse established, although the light saved many, there were still many shipwrecks occurring over the years. Keeper Eli Kimberley and his wife tended the lighthouse for 33 years and had 12 children. Tourists came in the summer to visit the keeper’s home where he built a small bowling alley with a well-stocked bar. After a drunken brawl involving about 20 men occurred on the Fourth of July in 1829, laws were soon passed prohibiting the sale of liquor at American light stations. Even with the presence of the lighthouse, between 1851 and 1882, there were over 100 shipwrecks recorded by Keeper Oliver Brooks near the lighthouse, through no fault of his own. He is credited with assisting in 71 of these events, whether the vessels were destroyed or partially wrecked. Brooks was Keeper from 1851 to 1882, and practiced his taxidermy skills on the isolated island on birds that suffered fatal crashes into the lantern windows. Eventually, the keeper’s house filled with stuffed birds and became a kind of local natural history museum. The family enjoyed playing musical instruments and would treat visitors to concerts at the lighthouse. Brooks was also credited with the rescue of five people from a ship grounded on the rocks near the lighthouse during a winter storm in November of 1858, where he received a gold medal. Faulkner Island was used as a test site for various types of fog horns and sirens. 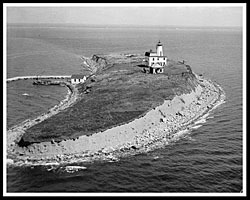 Today the lighthouse is being gradually protected and saved by the Faulkner’s Light Brigade organization. They were able to restore much of the lighthouse in 1999, with restoration efforts continuing. 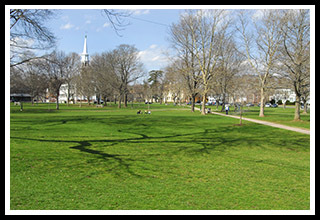 Guilford is a small picturesque community that boasts the largest town green in New England and contains five differing museums for visitors to explore. One of them, the Henry Whitfield State Museum, allows visitors a glimpse into the stone architecture that may have been used in the 17th century. If you feel like hiking, the WestWoods and Timberlands Trails system offers over 39 miles of trails that include cave structures, waterfalls, salt and fresh water marshes, an inland tidal lake, and carved rock sculptures and rock formations. In the fall, there is an annual open house for the public to explore the grounds and lighthouse, promoted and transportation provided by the Faulkner’s Light Brigade. The islnd is now a bird sactuary, and one of eight islands as part of the Stewart B. McKinney Wildlife Refuge. With the annual trip to the island, guests are given nature discussions regarding the local wildlife and preservation activities going on, and tours to the lighthouse tower. In the early fall, there is an annual open house for the public to explore the grounds and Faulkner Island Lighthouse. 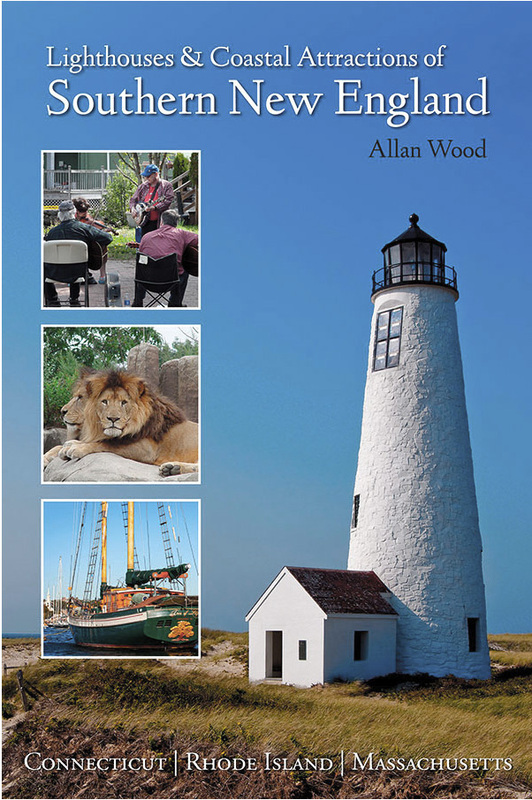 My new 300-page book, Lighthouses and Coastal Attractions of Southern New England: Connecticut, Rhode Island, and Massachusetts, provides special human interest stories from each of the 92 lighthouses, along with plenty of indoor and outdoor coastal attractions you can explore, and tours. There are more detailed stories of Oliver Brooks, Connecticut's most colorful keeper.